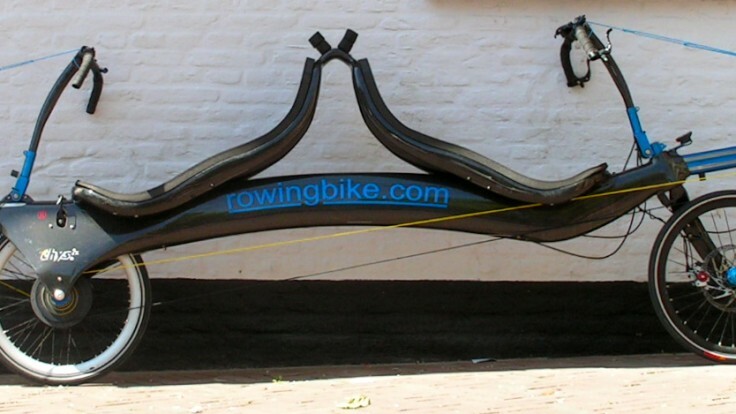 The very first Thys Rowingbike was made out of carbon. 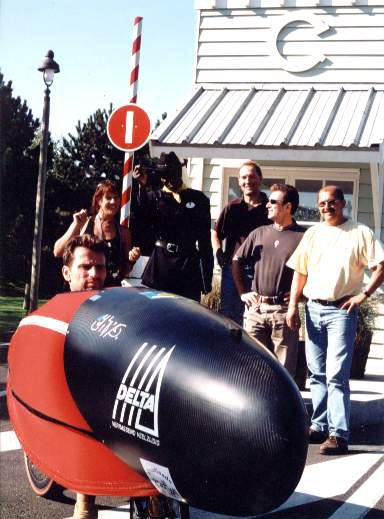 Using the experiences obtained from the first model, soon a second version was designed and build. 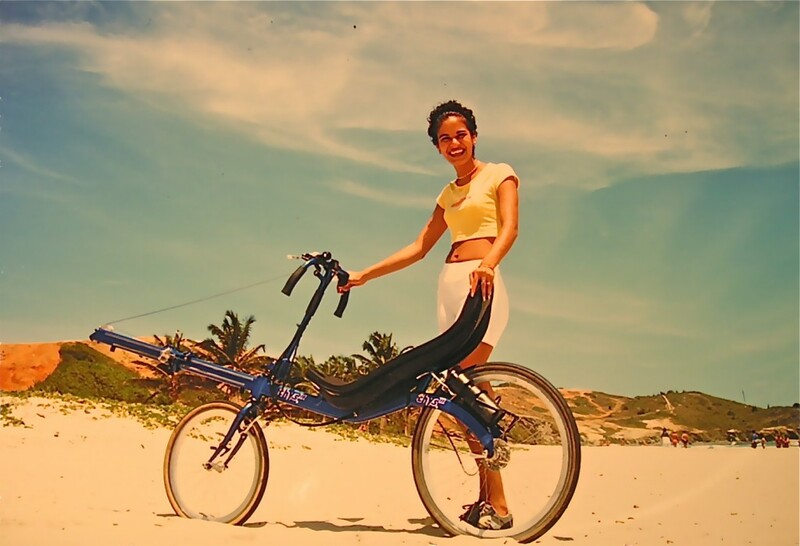 In the beginning this carbon bike had a 24” frontwheel and ”outboard” steering with 2 windsurfing boom rods. 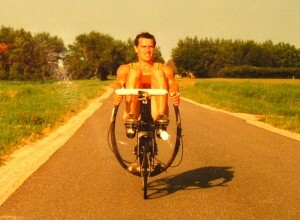 Later on a 28” front wheel was mounted and a steering bar with pivoting point just above the head set. 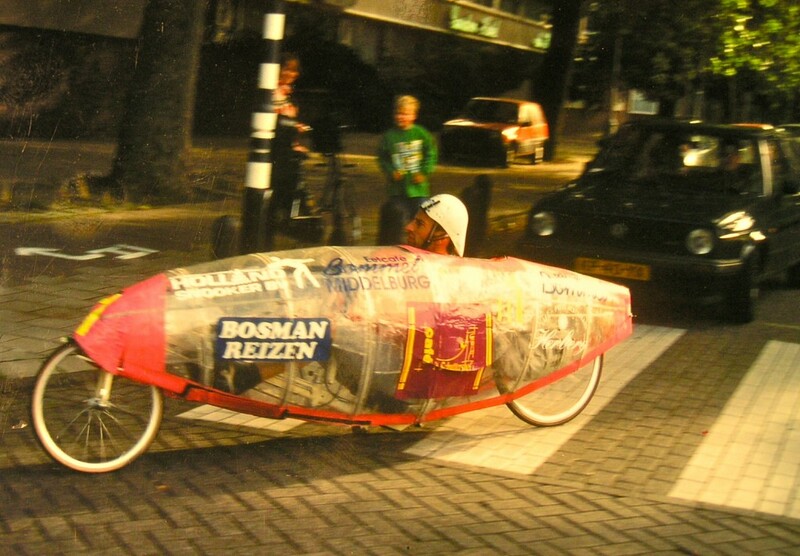 A sailcloth fairing made this a very fast rowingbike, it won the Tour de Sol in Zwitserland in 1989. 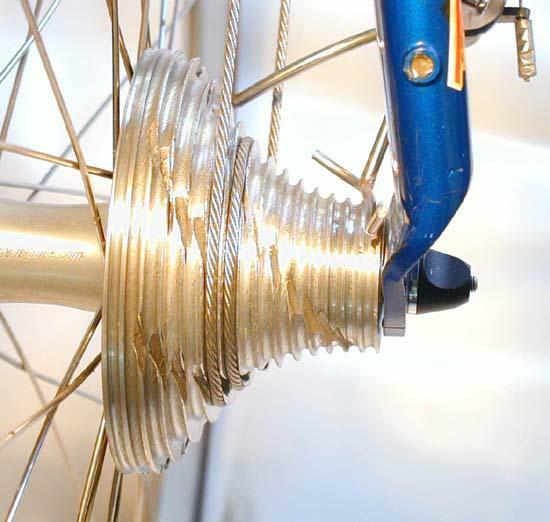 This version was made from a stainless steel tube somewhere from the dismantling of a milk installation. It was round, I think a diameter of 45 mm with a wall thickness of just 1 mm. The bowsprit was a square stainless steel profile of 40 x 40 x 1.5 mm. 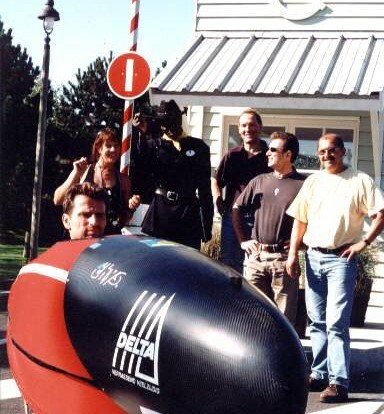 Convenient that the ball bearings of the footslider could run directly along this profile. After 5000 km the main tube broke off without prior notice. It was obviously too weak. 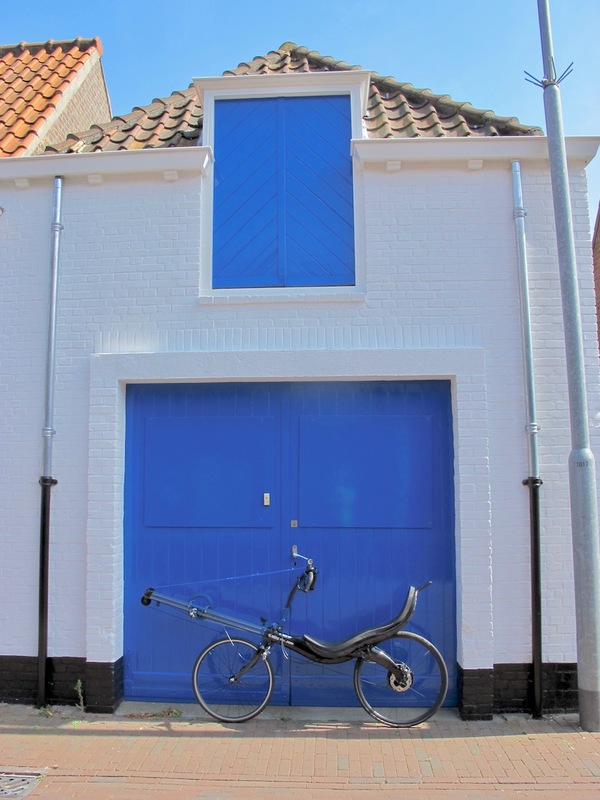 After this the main tube was reinforced with a crosstree and after a while of faithful service the bike was sold to Olympic wind surfer Bart Verschoor. Unfortunately no pictures. Full carbon or kevlar wheels were used a lot at the end of the eighties. 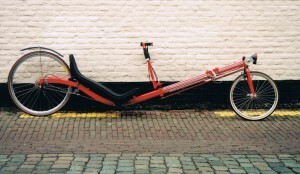 To cope with sidewinds the steering angle was made quite upright. 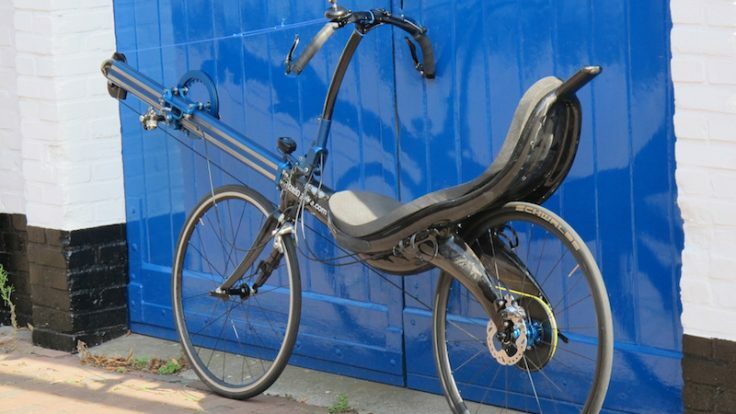 That made this bike rather nervous. 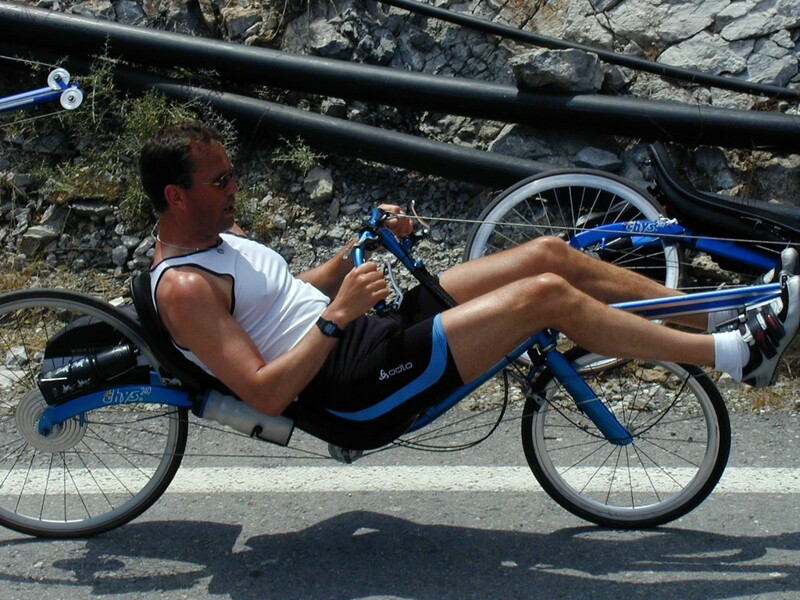 Nowadays rowingbikes have much more reclined steering angles which makes steering more stable and brings the front wheel more forward. 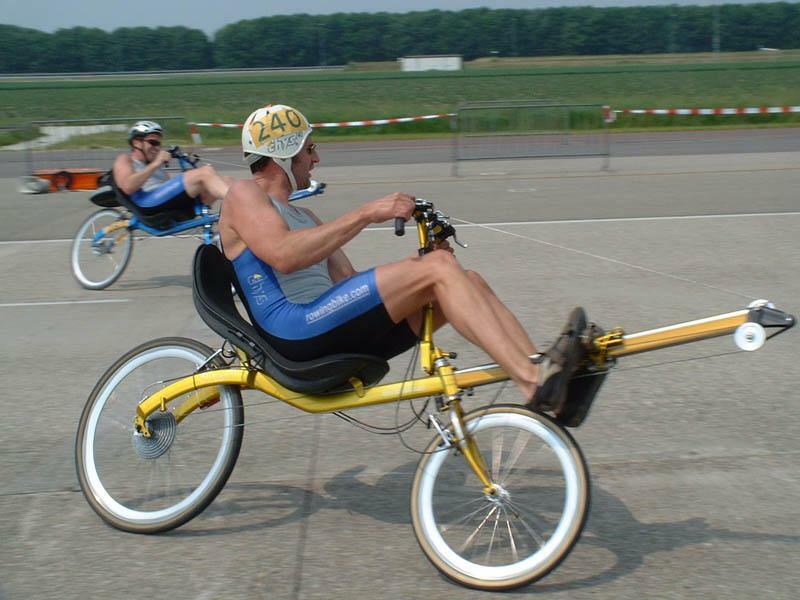 With the center of gravity further behind and lower nowadays rowingbikes can brake much more aggressive than these older high rowingbikes. Approximately 50 were made from 1990 to 1998. 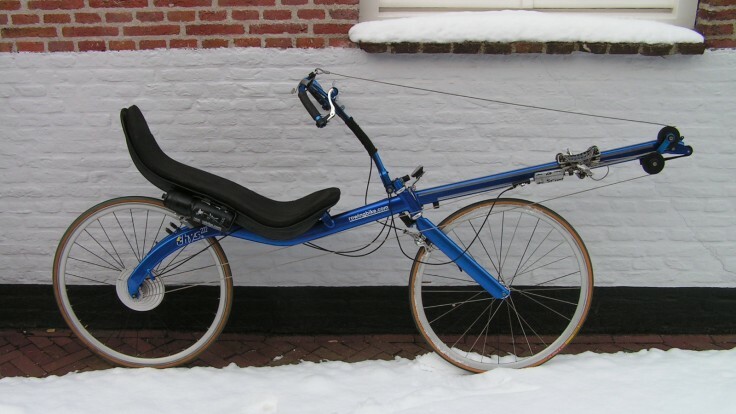 Around 1990, the first cable driven rowingbike showed the potential of steel cable propulsion in stead of a chain. 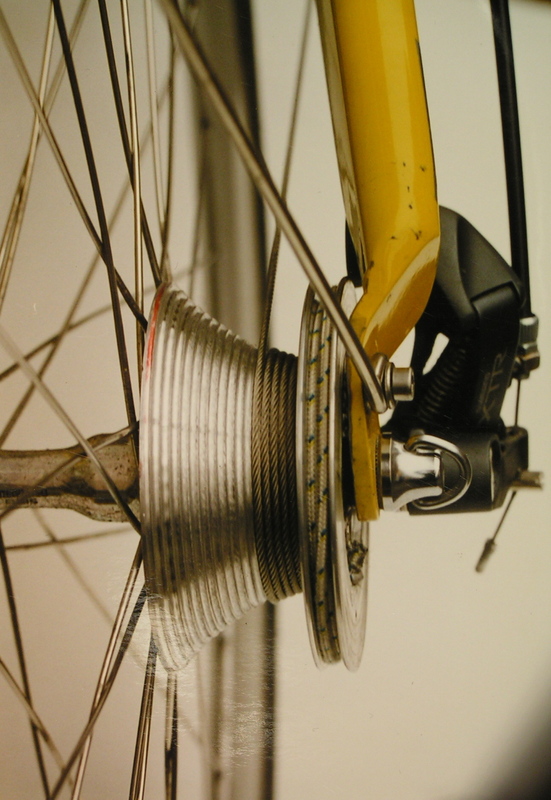 However, the gearing system of this type of hubs proved to consume too much energy. Energy loss that we poor human beings cannot spare. 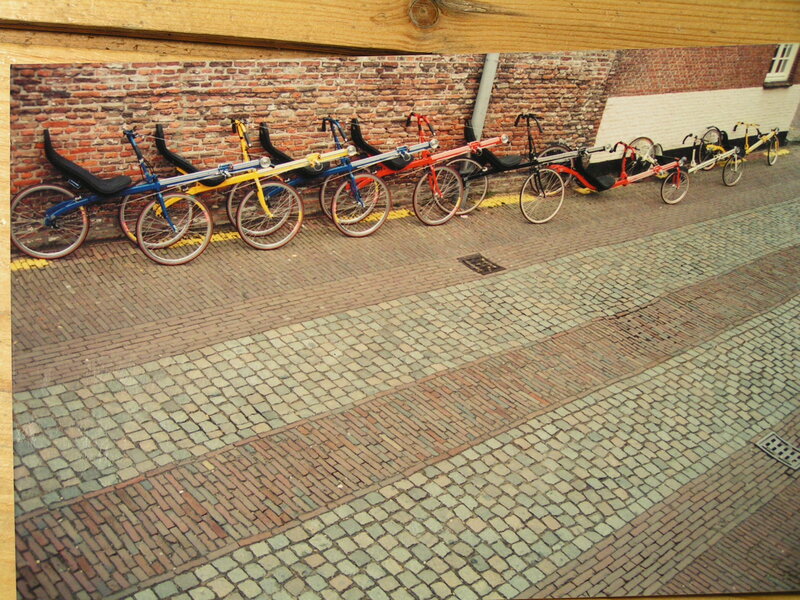 Left on the picture you see a rowingbike for children made around 1990. 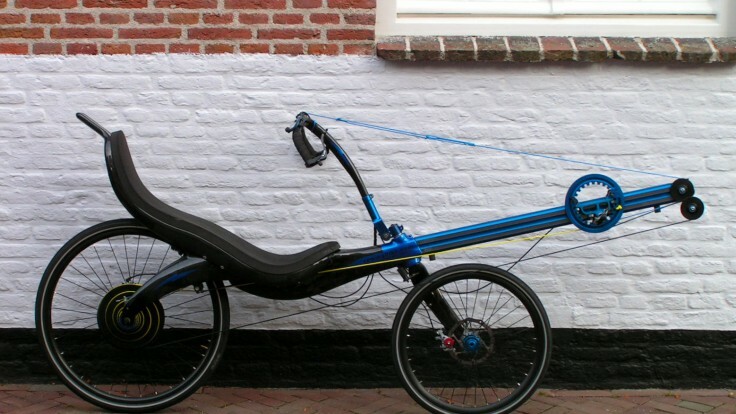 On the left an M5 recumbent for children. 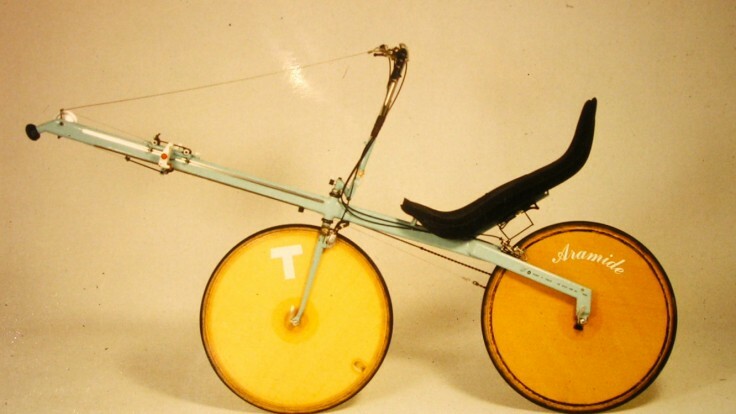 Of both bikes only one prototype was ever made. With this very low rowingbike, equipped with a fairing, Derk won the 1994 edition of the Paris-Amsterdam human power race. 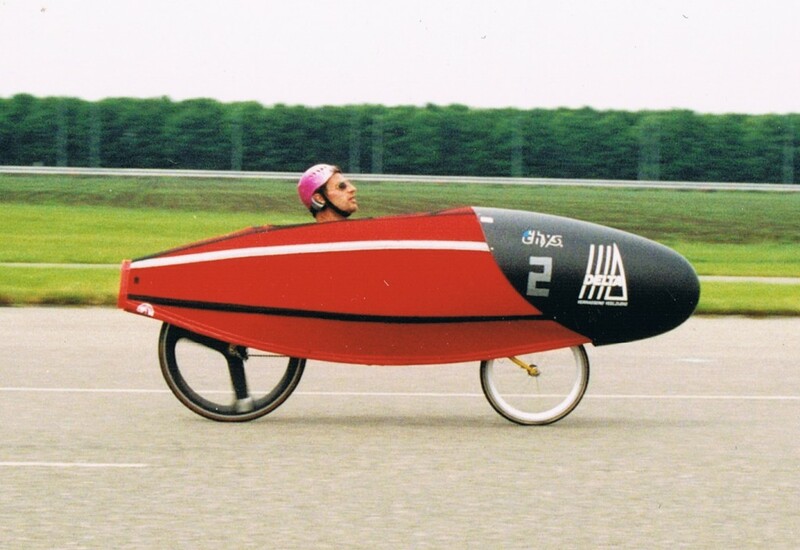 Technically this is a three-wheeled rowingbike, since there’s a skateboard wheel mounted on the lowest part of the bike to cope with speed bumps. 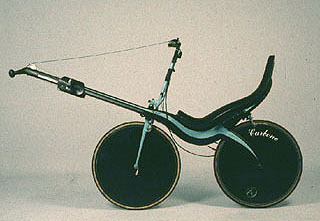 A very low rowingbike, of which only around 11 were produced. 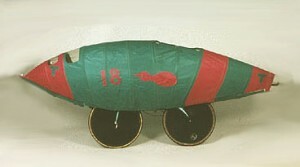 Build from 1994. 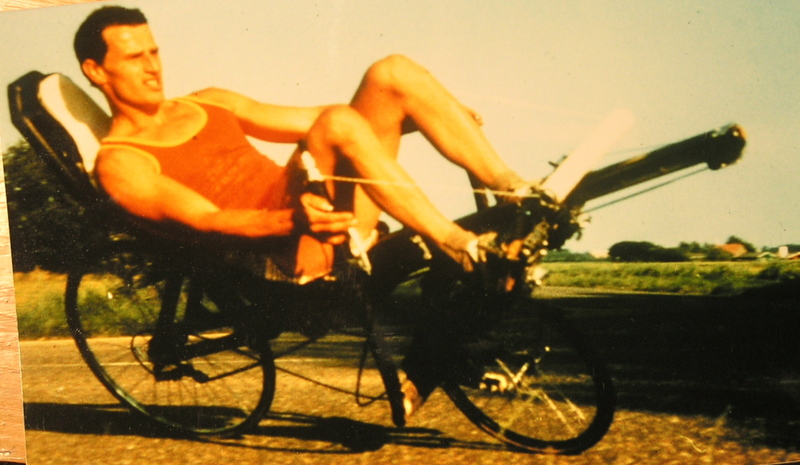 A few of these 280 models were equipped with a sailcloth fairing that made it very fast. 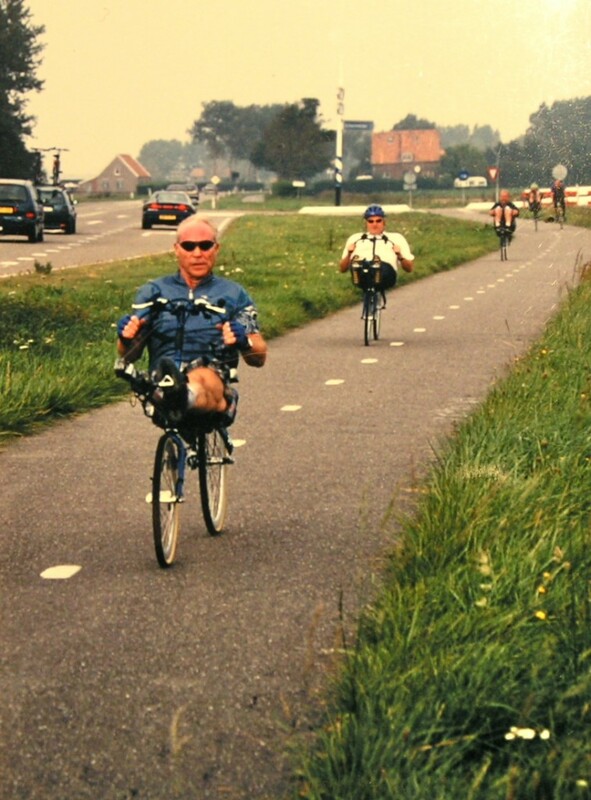 In 1994 it won the first Paris – Amsterdam bike race in awful weather. 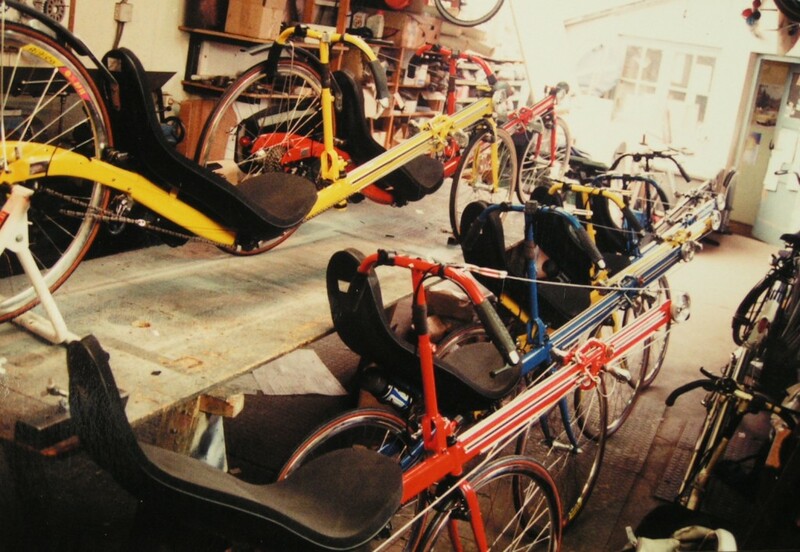 All 220 and 280 models were handmade and welded in Derk’s small workshop. This is one of the rare occasions with a lot of finished bikes on stock. 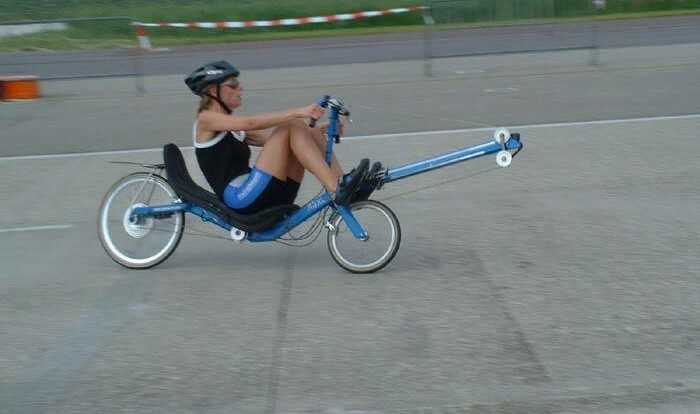 It is possible to add a fairing to this rowingbike. 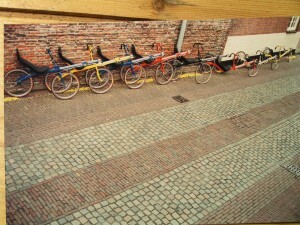 On the photo you can discern six water bottles of 0.75 litres each. 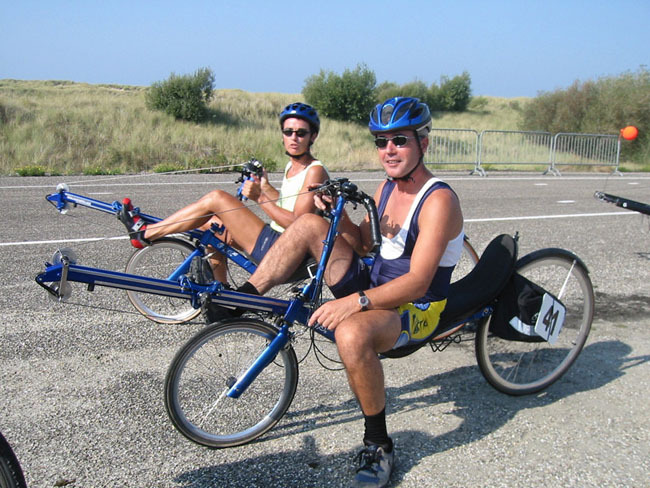 According to Derk, this is not enough for a 6 hour race like the one on Cycle Vision in Lelystad, Netherlands. 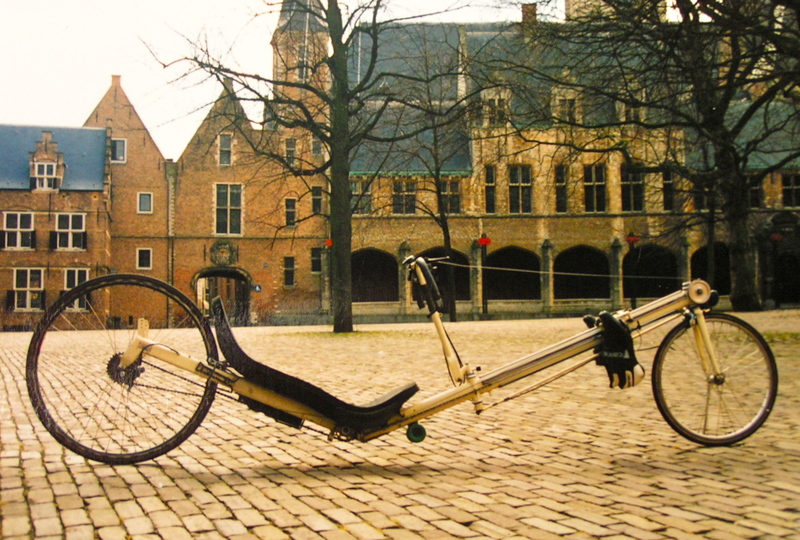 The Thys 240 is the precursor of the Thys 222, but was thought to be a little too extreme in terms of seat angle and height. 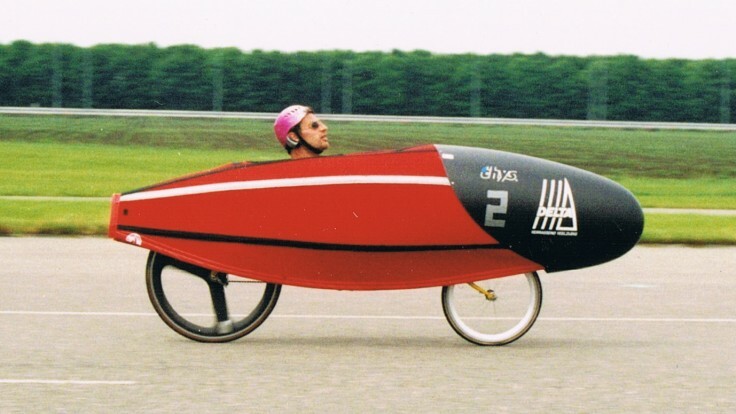 The Thys 240 (prototype) with fairing (rubber/carbon) during the 6-uurs race in 1998 (Cycle Vision, Lelystad). Thijs accomplished an average speed of 47.9 km/hour! He also did the one-hour race. 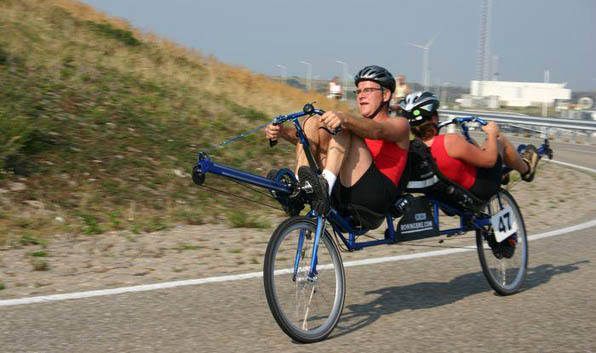 Result: 53.8 kilometers. 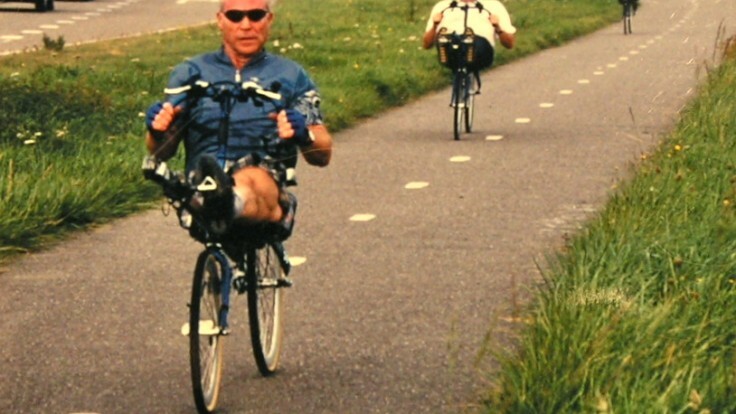 The concept of the Snek transmission was designed by brothers Bert and Derk Thijs around 1992. It took until 1997 before Derk bought his first lathe and he actually started to make prototypes. This very first Snek was made out of aluminium with a 2 mm wide groove (pitch 2 mm) for a 2 mm steel cable. 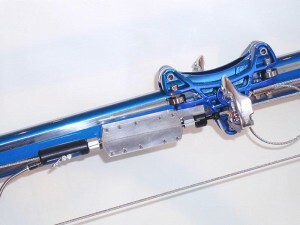 This fist attempt was a primitive version of the current revolver system. 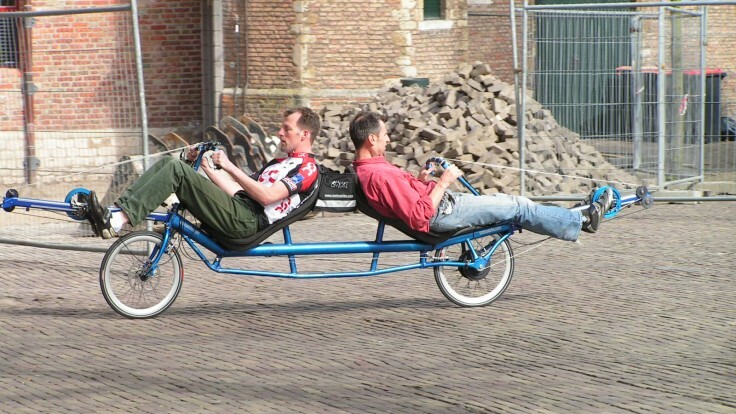 Back then Derk found it hard to get the revolving principle working and it was not the only problem he had to cope with. 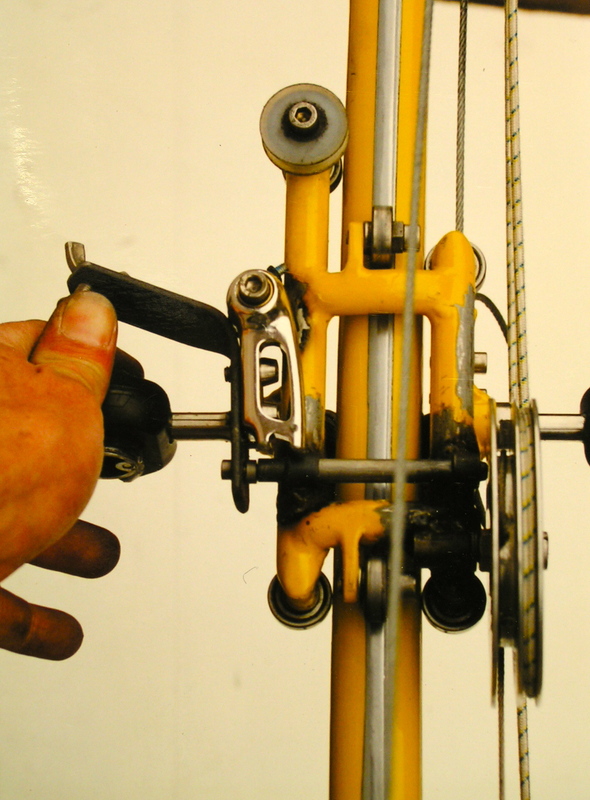 As there were more problems, he started with what appeared to be the most simple shifting system, by derailleur. 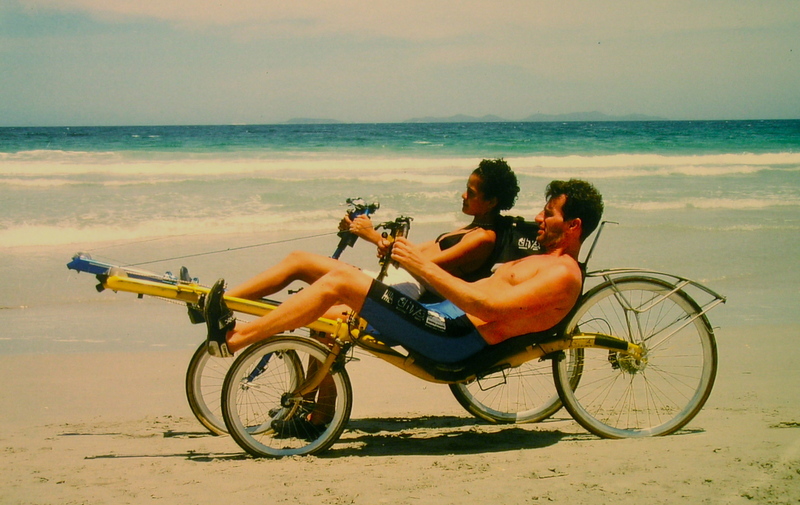 Derk says that, in retrospect, it was one of the most stupid mistakes he ever made. “I should have sticked with that revolving system”. Concentration at the start of the Paris-Amsterdam race (start at Eurodisney). 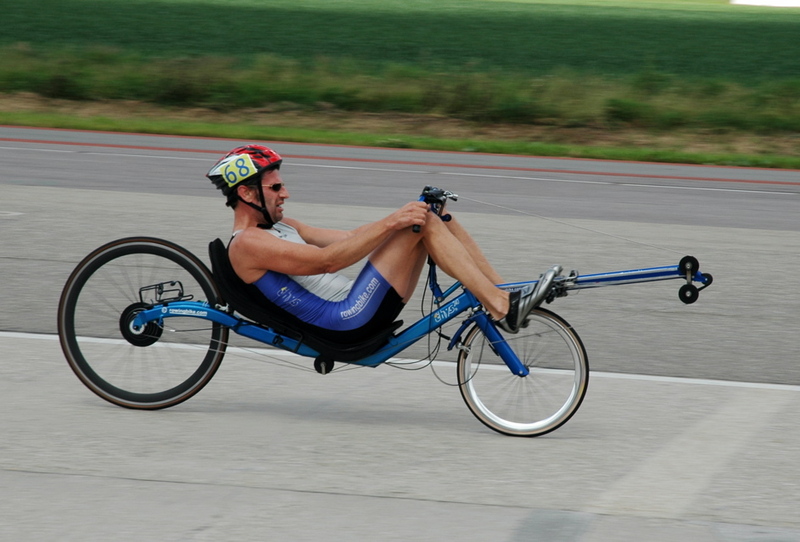 Derk covered the distance of 510 km in 13 hours 53 minutes. 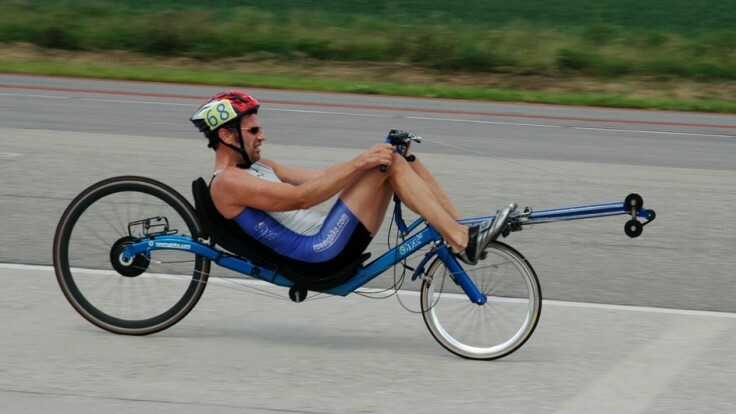 This record only lasted one week- thank you Ymte Sijbrandij- but it was still pretty fast. 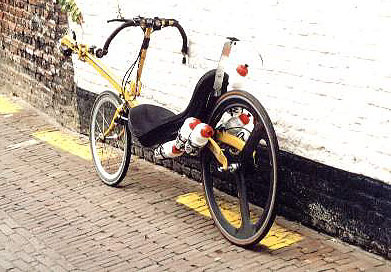 The first 222 model was made in 1998 after the 240 model was thought of as a bit too extreme for the large public. 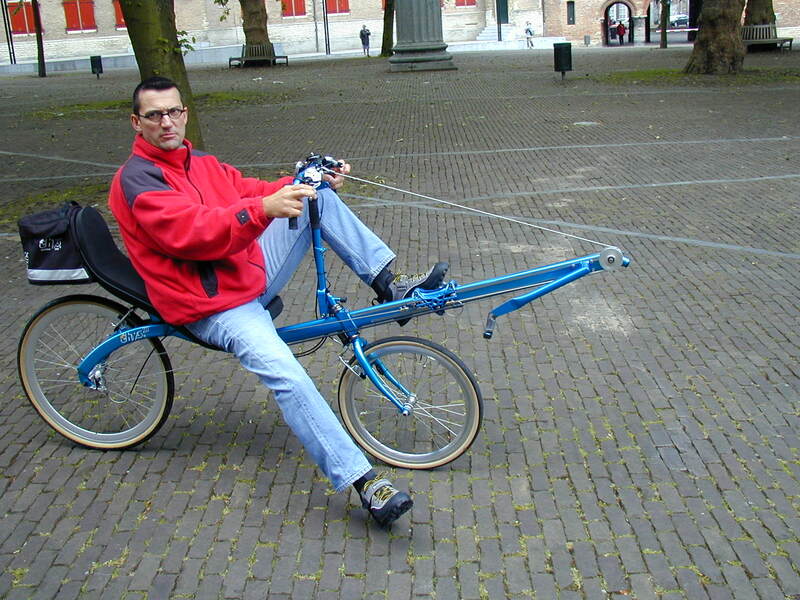 Therefore a somewhat higher and less reclining model was designed. That was a good choice for a change! 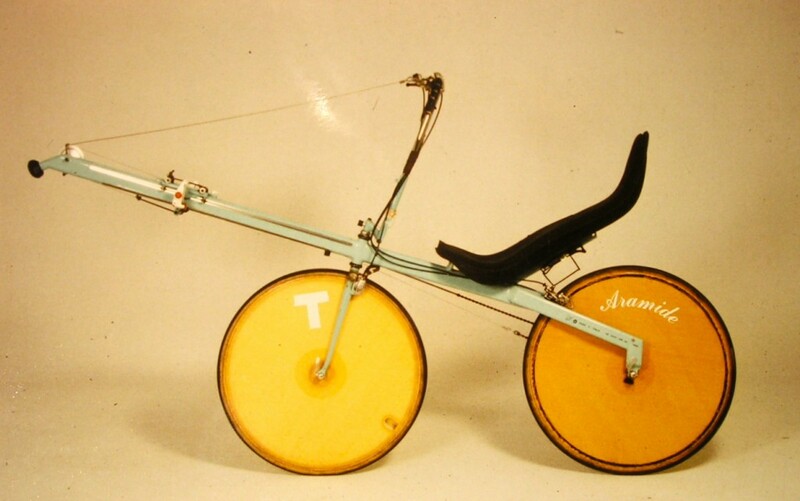 This model was the first of which the frame would be produced in Taiwan and in larger quantities. 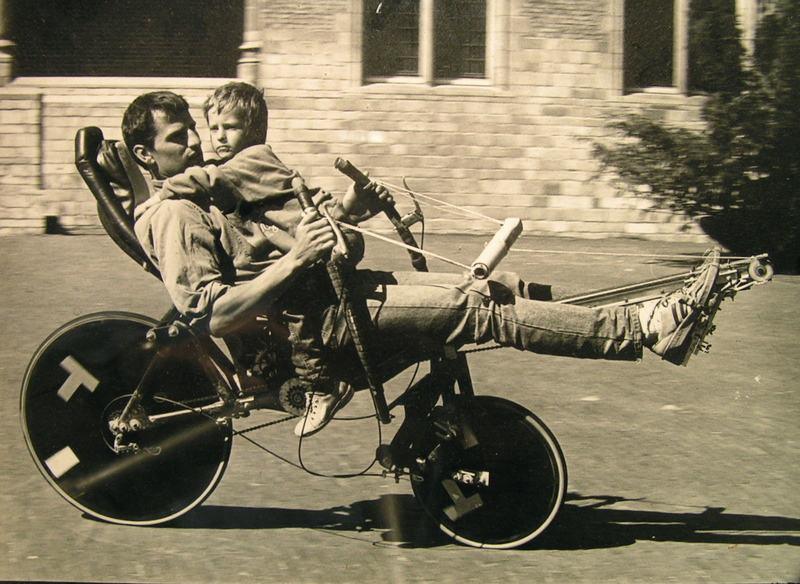 In fact it was the wish for (expensive) university studies of my children Sara and Derk that pushed me to make this large step to production series of 100 bikes in stead of just 10 or so per year that I could weld on my own. Thanks guys, for pushing me in the right direction. And for finishing your studies by now! 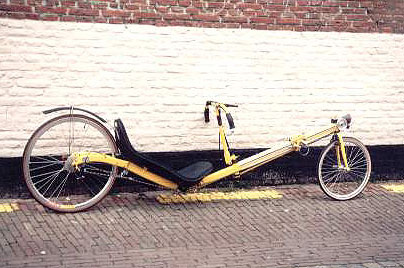 This gold coloured 222 was the first prototype for the RR version. 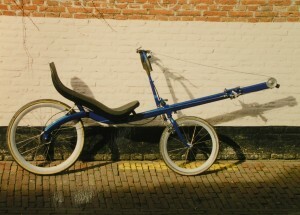 A lot of modifications were made on the standard 222 frame to hold the asymmetrical home-made rear wheel. 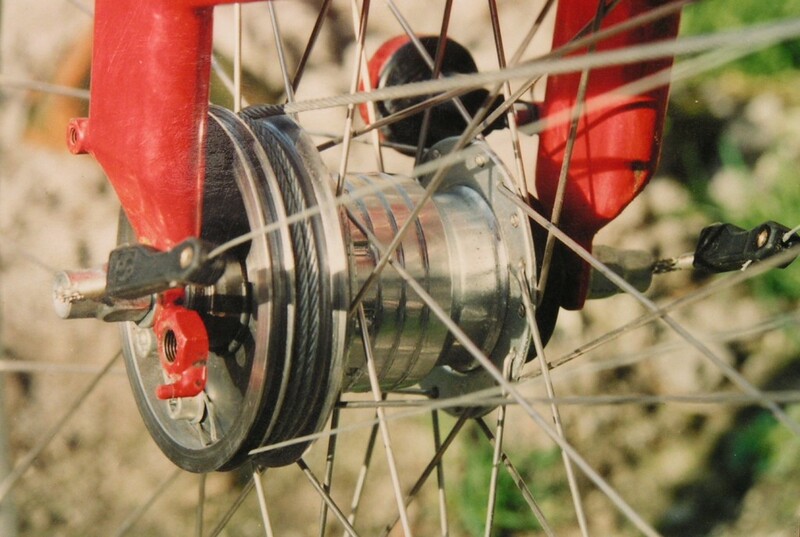 The hub contained the roller ramp freewheel clutch that improved the catch (“inpik”) at the beginning of the stroke a lot. 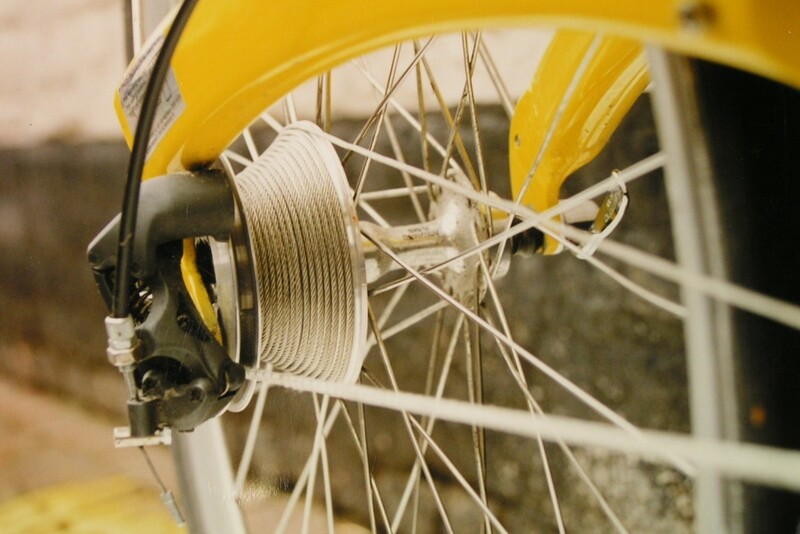 The RR version of the 222 has the THYS design rear hub with roller ramp freewheel clutch. 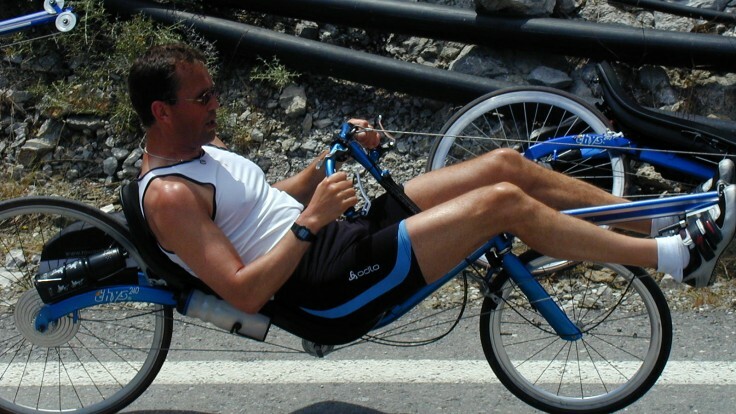 This -very expensive- clutch ensures a direct grip on the rear wheel in the beginning of the stroke. The shifting system has improved but is not perfect. Diameter of the snek is limited to 120 mm. 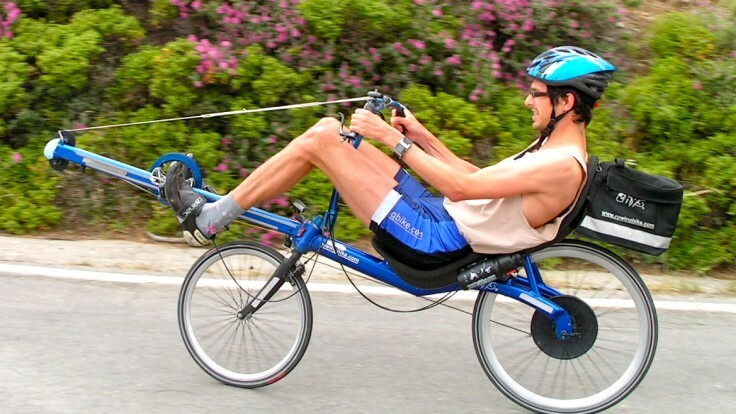 Only tall people can shift to the lowest gear while riding. 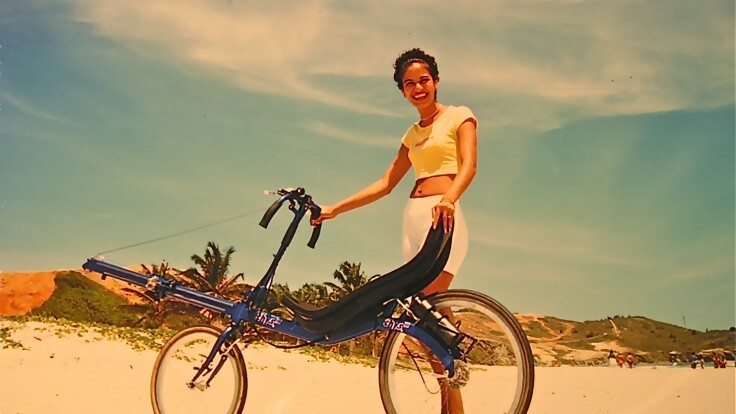 The Rowingbike Tour de France was a turning point in several ways: it resulted in new technical developments and it encouraged quite some potential rowingbike riders to actually buy a rowingbike. 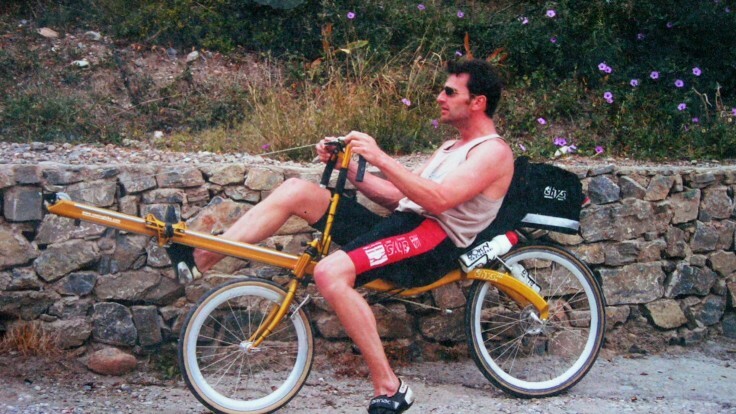 After my Tour de France experiences with a very poorly working intermediate Snek it was clear to me that I had to principally change the gearing system. 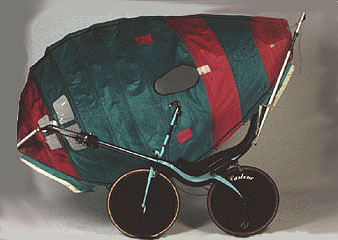 The CVT was a nice solution although the first version with the round shaped wedge housing jammed every now and than. 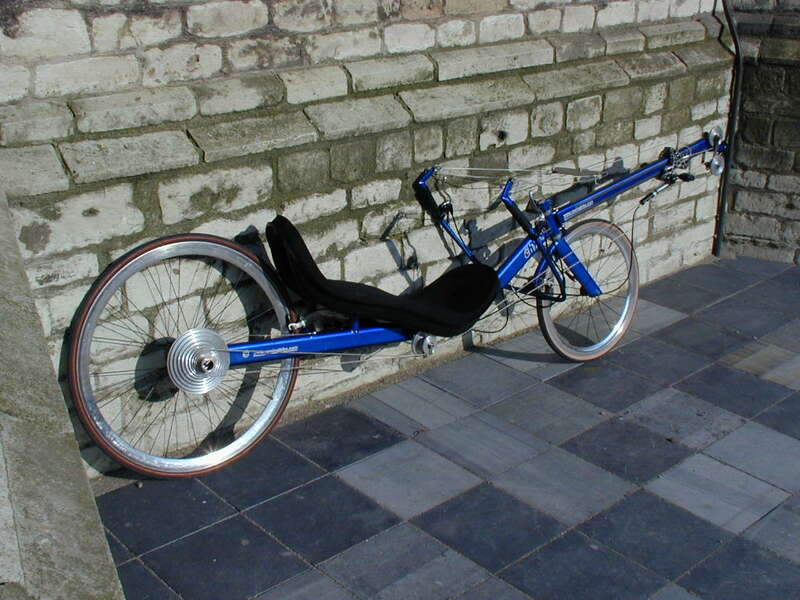 The THYS 230 with 20 inch rear wheel and 16 inch front wheel. 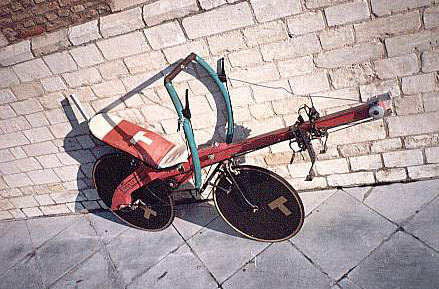 This is one of the first CVT’s. 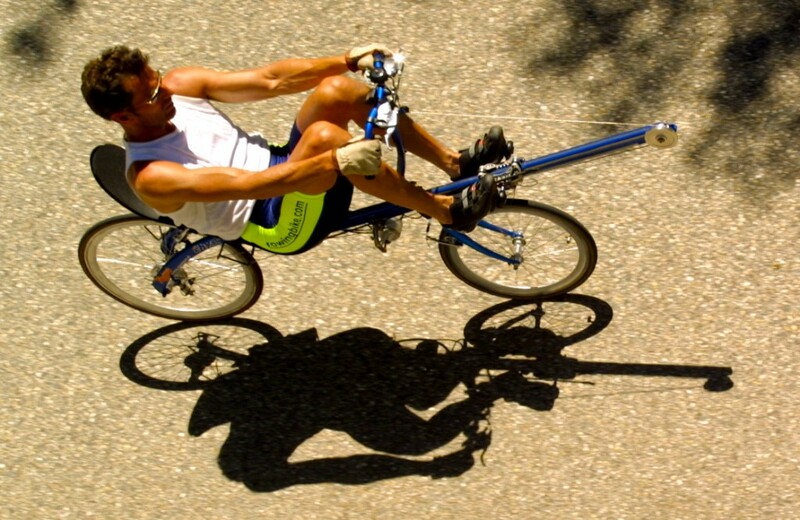 Sometimes tests of extremes can help you further. 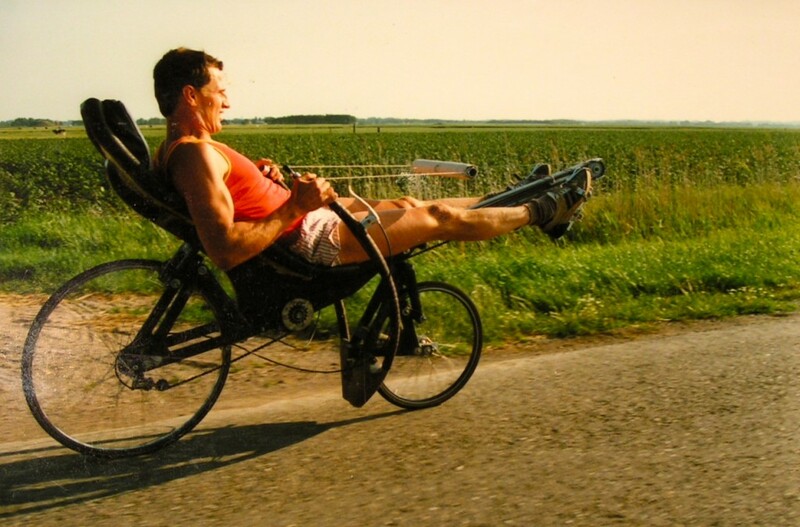 After the compact THYS 230 with 20 inch and 16 inch wheels it was interesting to know how two large wheels affect the speed and handling of the rowingbike. I suspected it to be fast and spend a lot of extra time on machining and drilling the footslider and the wedge housing of the CVT system. 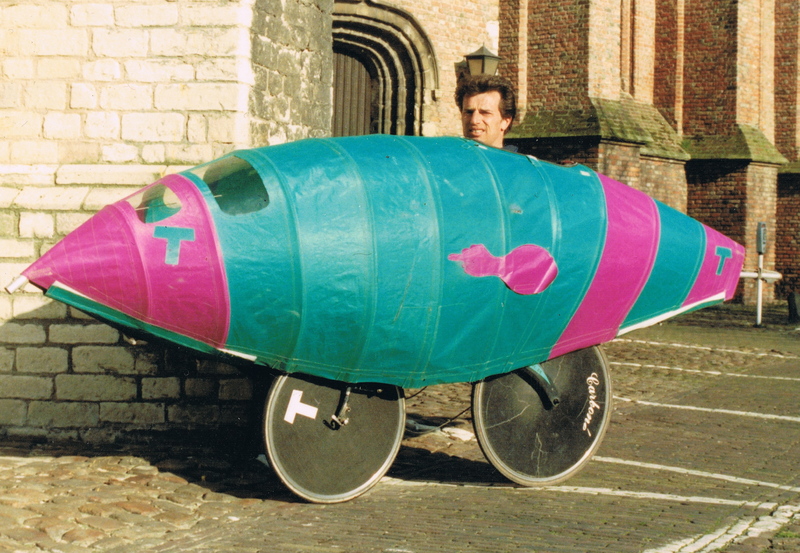 In the end, it turned out not to be fast and very unpractical. 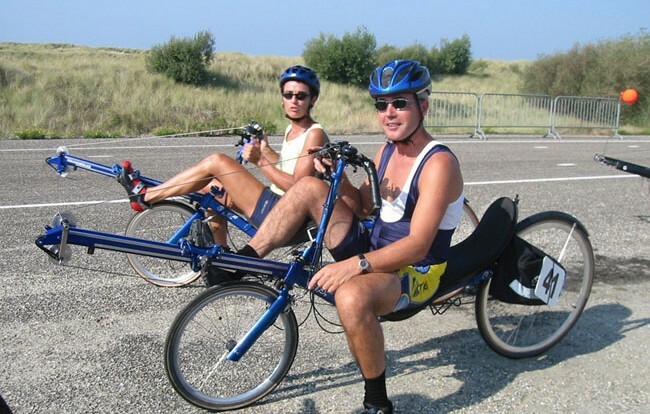 It turned out that the rowingbike is a great solution for people that can only use one leg. 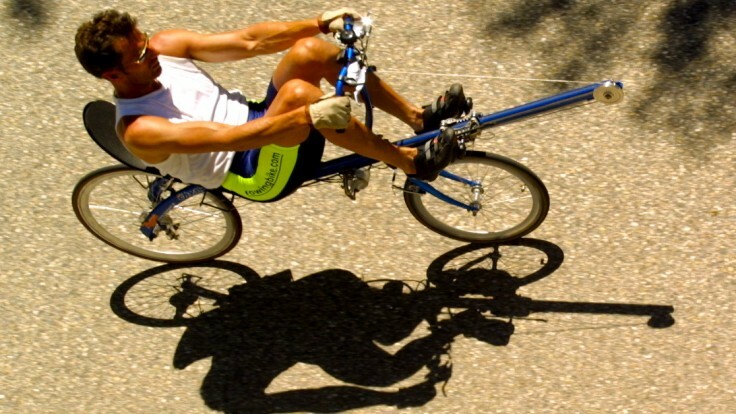 There are over a dozen rowingbike riders that only use one leg to propel the rowingbike. Starting off is hard to learn, but the effort pays off. 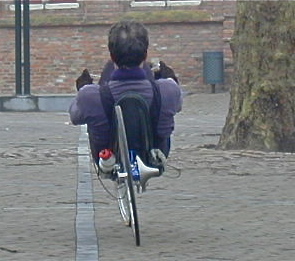 Since the rider also uses arm and back muscles, speeds are not much lower than when all four limbs are used. Nowadays each footslider already has extra attachment points for additional bearings. 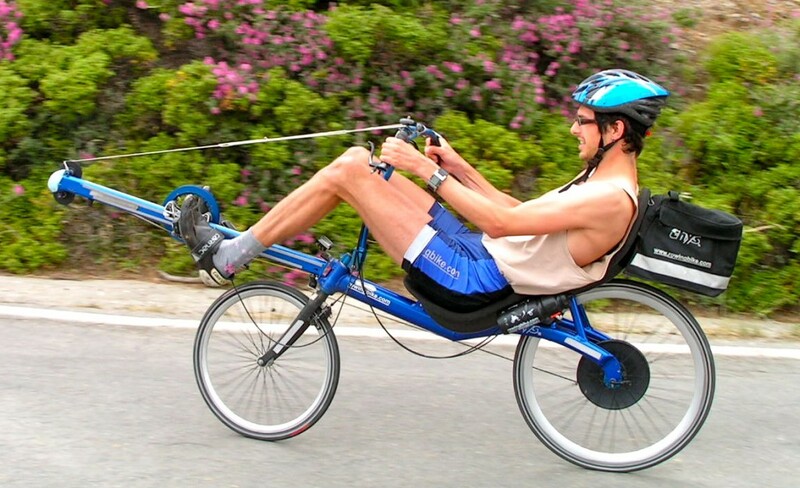 These are necessary to cope with the high asymmetrical forces these riders exert on the foot slider. All clients received this new wedge housing with needle bearings free of charge. 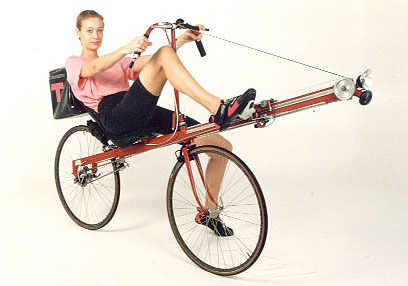 It was a nice try but it did not work; very unstable. 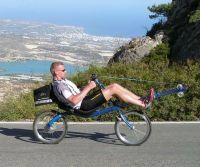 Ed Komen ascending to Males, Crete on his 245 model. 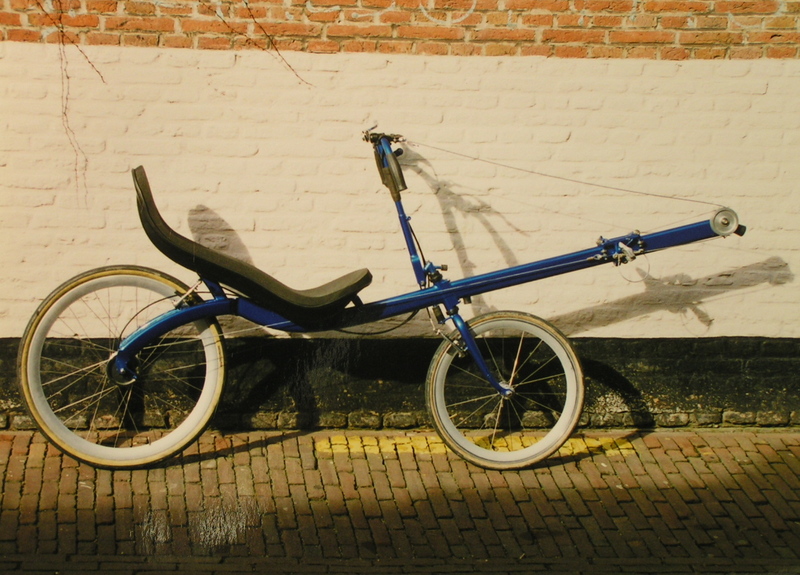 The 245 is a lowered 240 prototype with symmetrical front wheel. 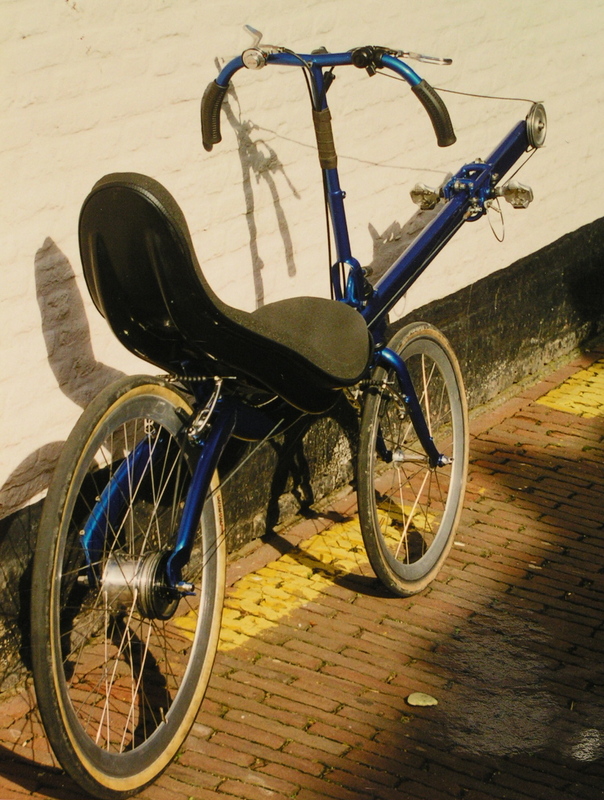 The seat is approximately 4 cm lower than the 240 series. The THYS 250 was an ongoing study for a follow-up model for the 222. 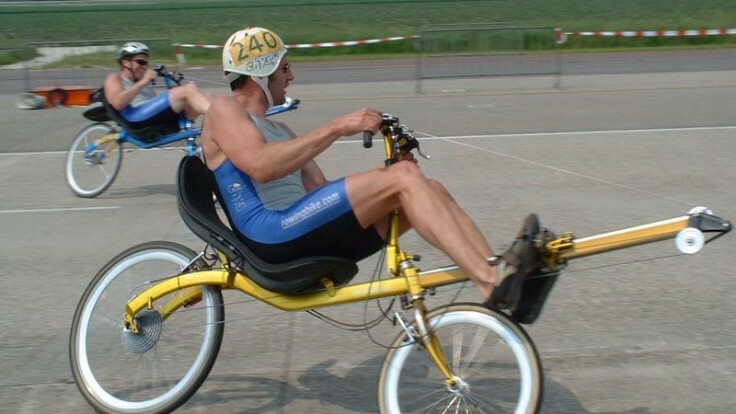 After the THYS 245 prototype I tried to build a similar very low and fast rowingbike, but with the addition of an asymmetrical rear wheel. 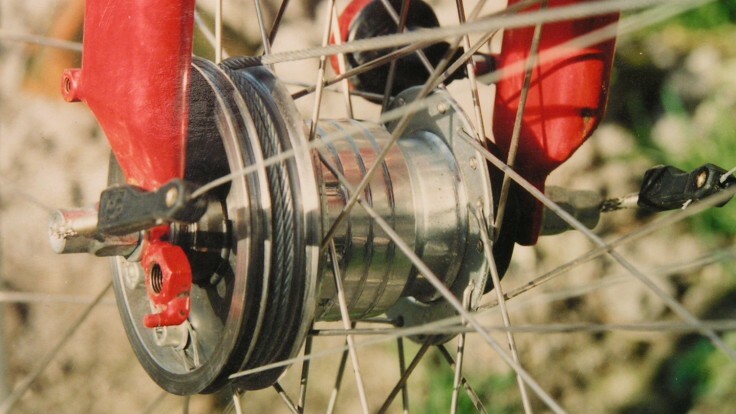 The frame tube was in the centre of the bike, the wheel on the left side of the tube and the Snek on the right side. Large wheel bearings were placed in the frame tube. 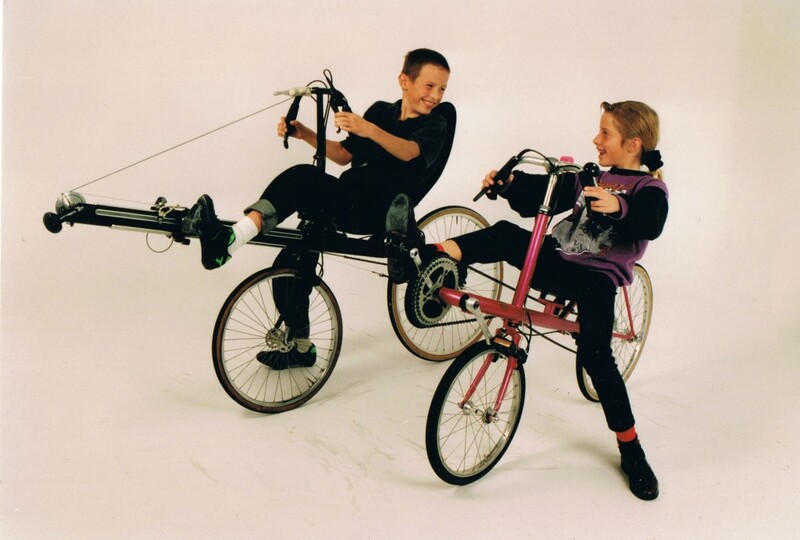 A very interesting experiment but not successful. The THYS 222 Revolver with 2 x 20 inch wheels. A precursor of the 220 mm snek was the 178 mm snek on a 20 inch rear wheel. 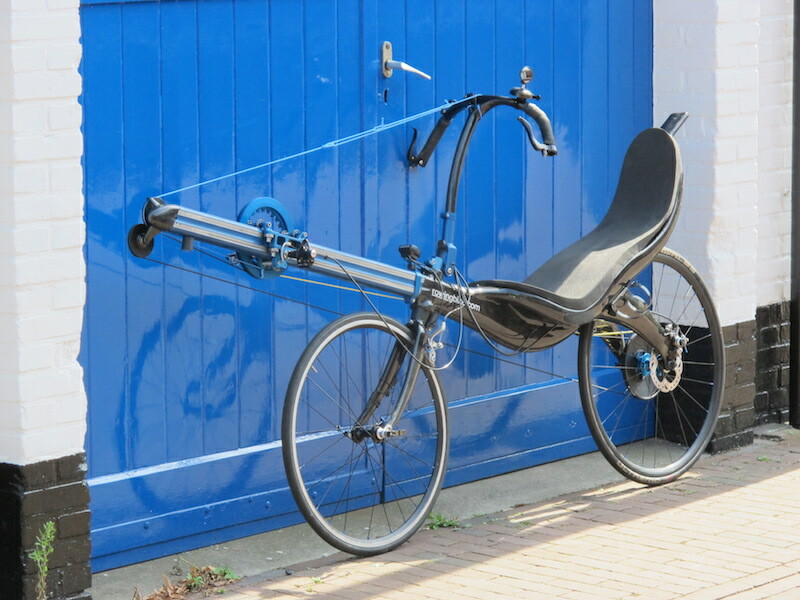 A desirable gear for really steep slopes like Calibier and L’Alpe d’Huez. 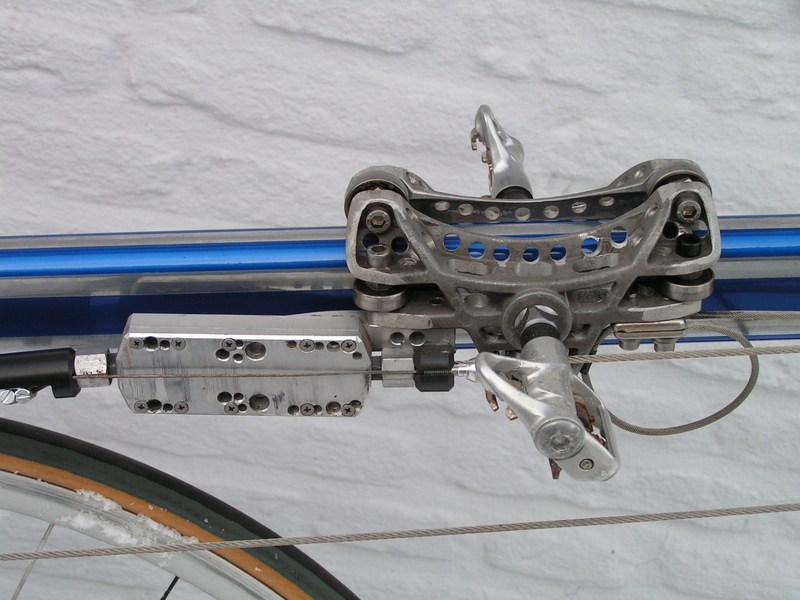 The new revolver shifting system was developed winter 2004-2005 and thoroughly tested before introduction. 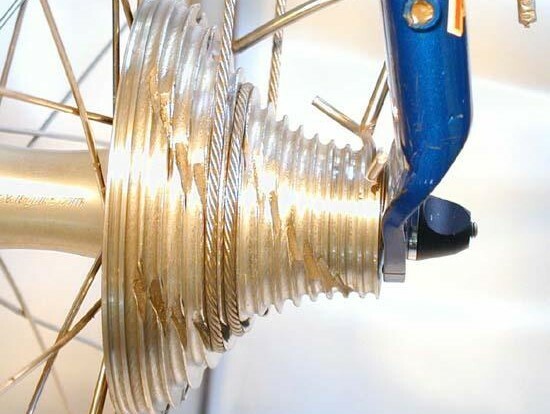 Thanks to the revolver system and plastic sneks, Dyneema® cord can replace the heavy steel propulsion cable. It is a real thrill to see a 28 gram Dyneema® cord bringing the heaviest testrider (well exceeding 100 kg) up the steepest mountains. After the introduction of the revolver system there were no wishes left at the field of shifting mechanisms, it is a perfectly working system. 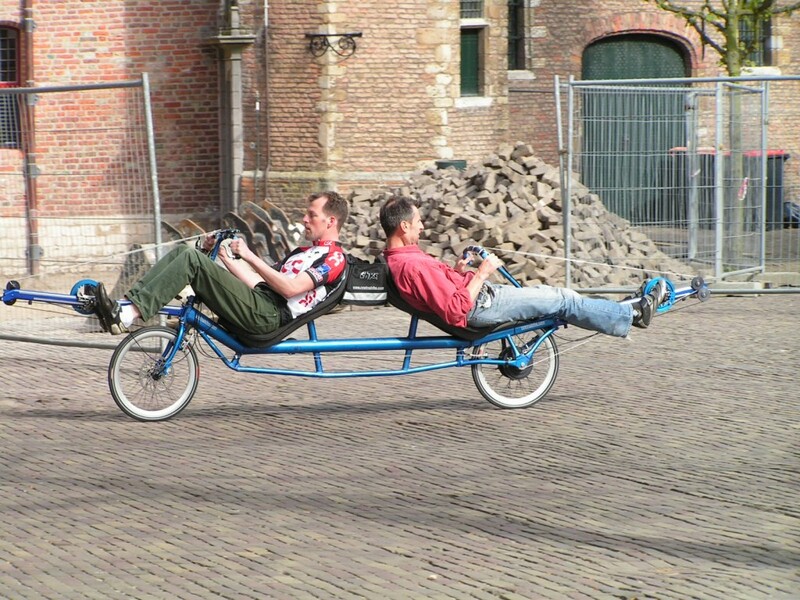 This gives opportunity to go to the next challenge: how to build a effective rowingbike tandem. 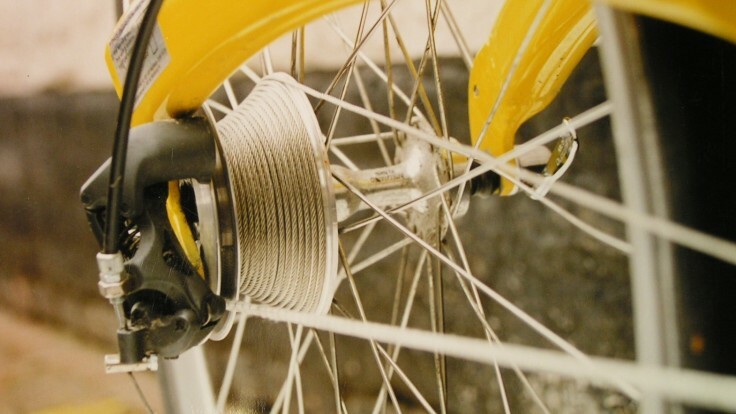 This steel version already worked very good, but it turned out to have a few points that can be improved. 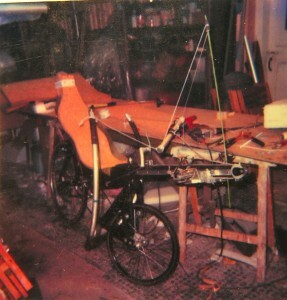 After the experiences with the low and long prototypes a more compact model, similar to the 222 model, was designed, build and tested. 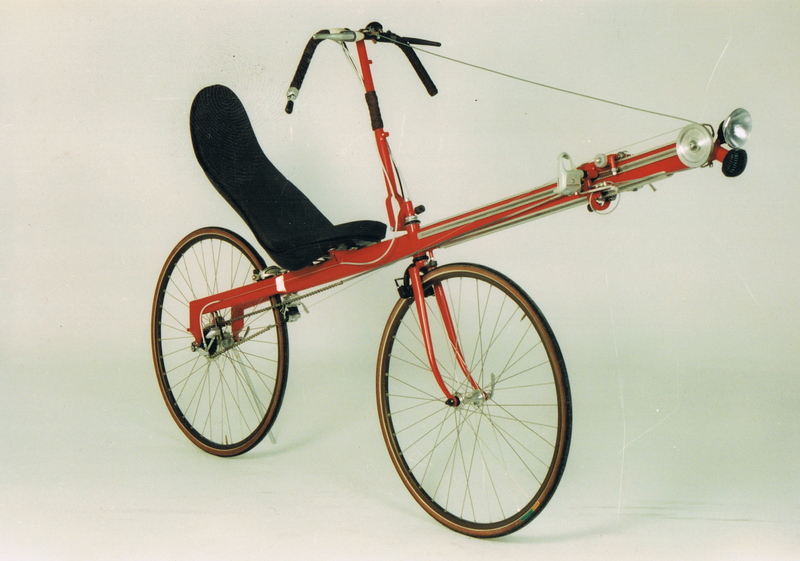 This was the steel version with aluminium steering bar, weighing 13 kg. 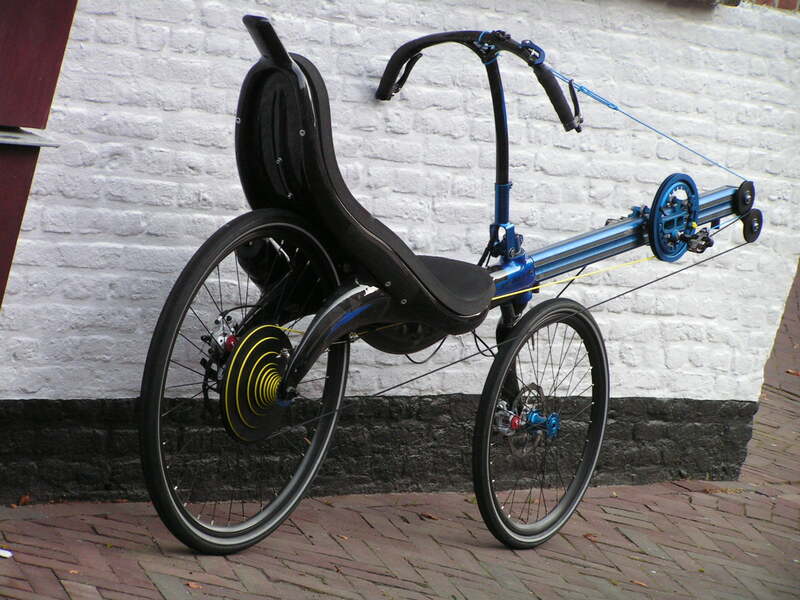 Another improved and lighter 209 prototype was made in 2007, weighing just 11 kg. 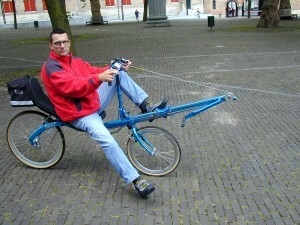 Martijn Mateman confirmed the importance of weight during ascends. 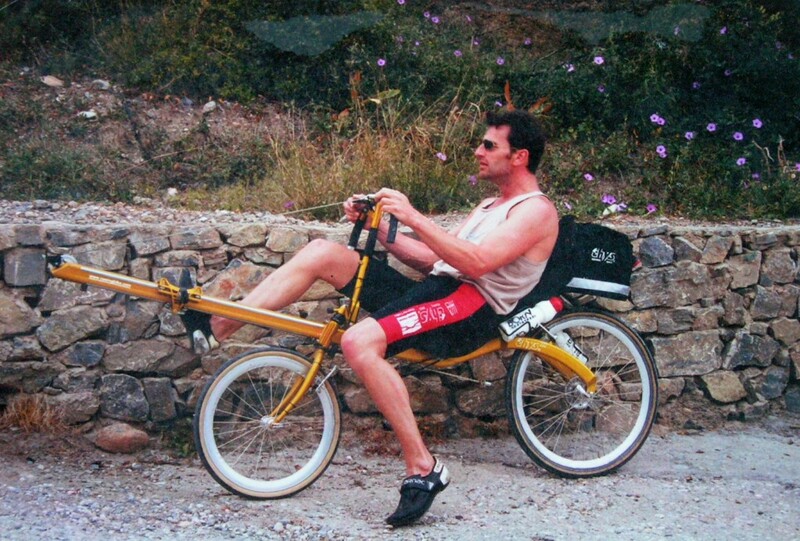 He improved his time to Males, Crete by 5 minutes, getting there in 40 minutes on a 5 kg lighter rowingbike. 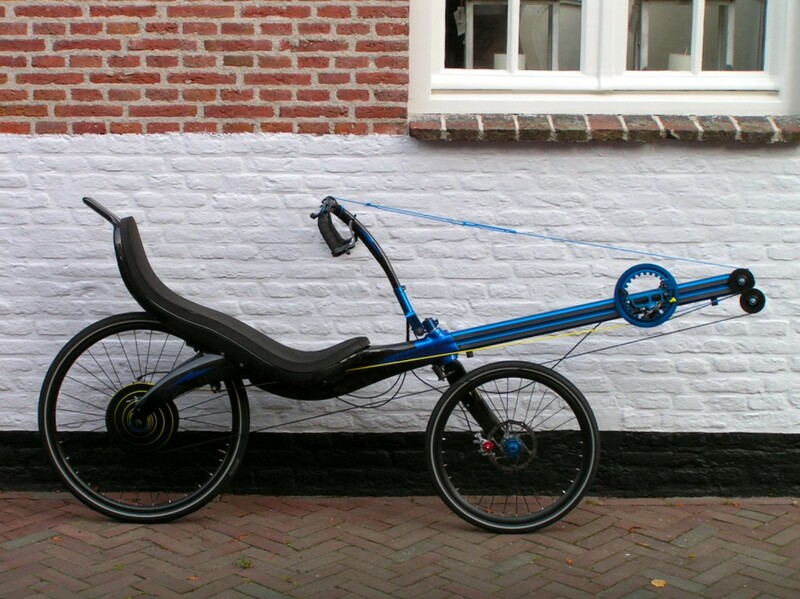 It is a low, light and fast tandem with two 20 inch wheels. 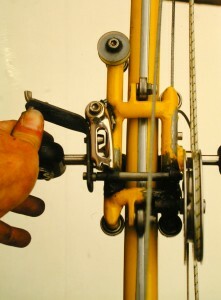 Cables from the rear rider go straight to the left snek, without intermediate axle. 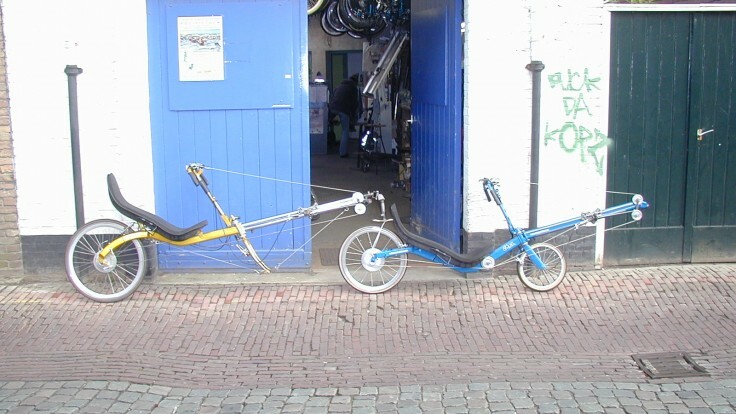 The tandem performed really well on long distance tours and races. 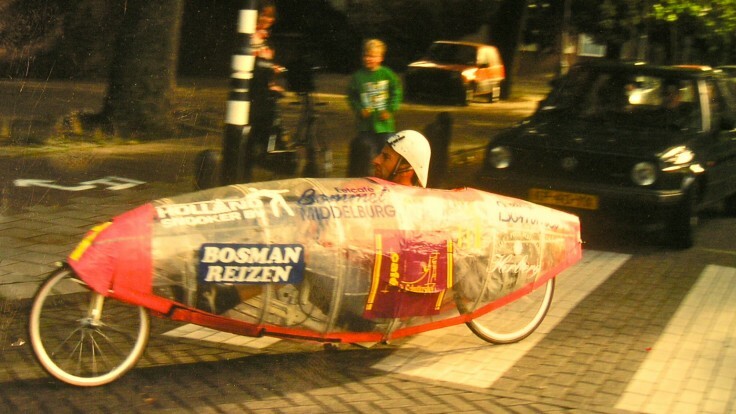 Long distance racer Theo Homan bought it and rode an extra 600 km within 24 hours, compared to another 24 hour race with Richard Bruijn and Derk Thijs. After the 209 prototypes it was clear how the follow-up for the 222 model should look like. It took a lot of time to find the right production company and to study their production process. 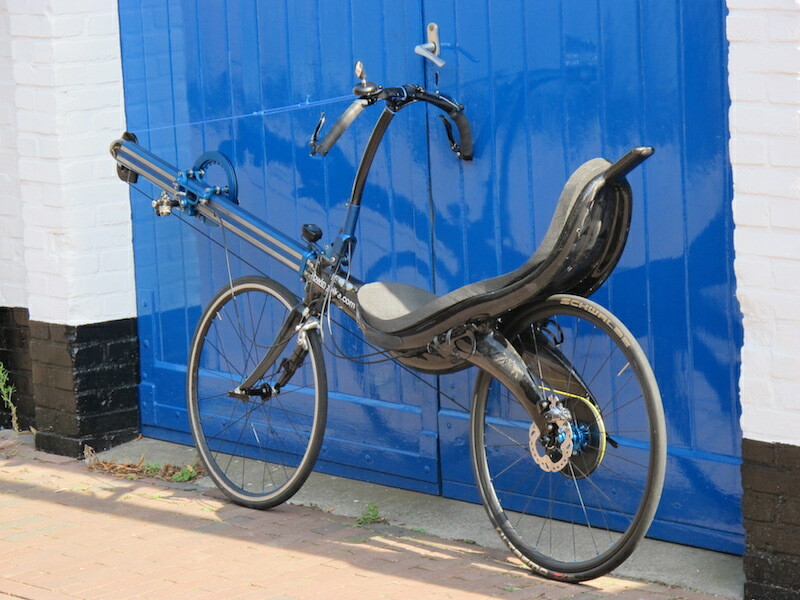 Subsequently the 209 design was adapted to this production process to enable production and improve stiffness of several carbon parts. 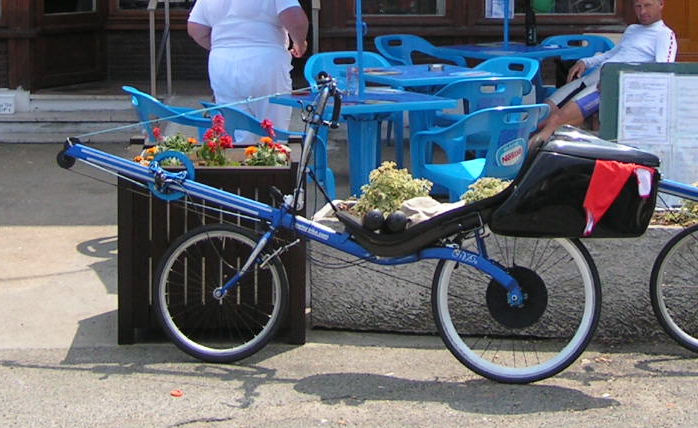 First production samples came at Christmas 2009, series production started half a year later after thorough testing. 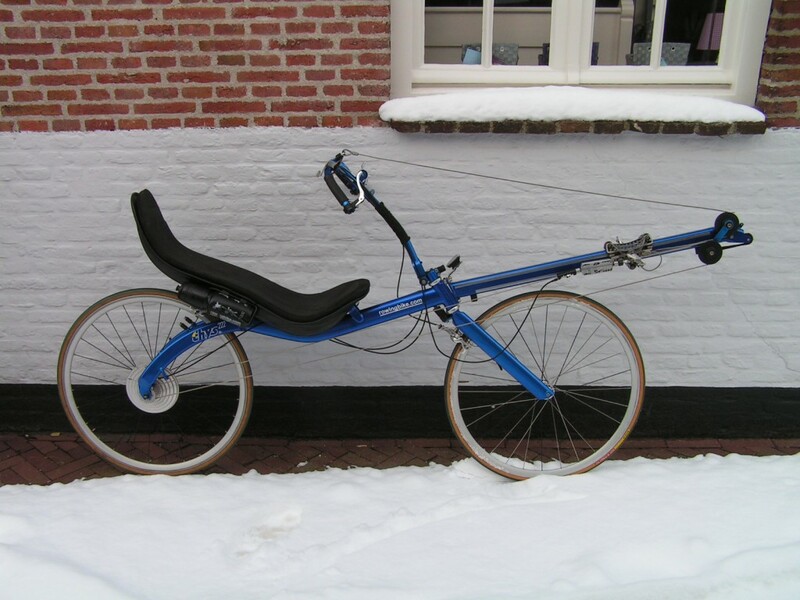 During the winter of 2008 /2009 the carbon tandem frame was designed the old fashioned way: take a piece of balsa wood and foam and shape it as you want it to be. 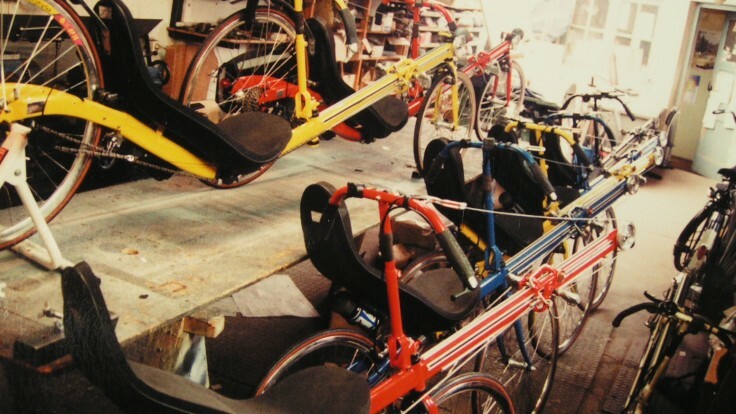 It took more than a year to finish the moulds but it was worth all the work and waiting. 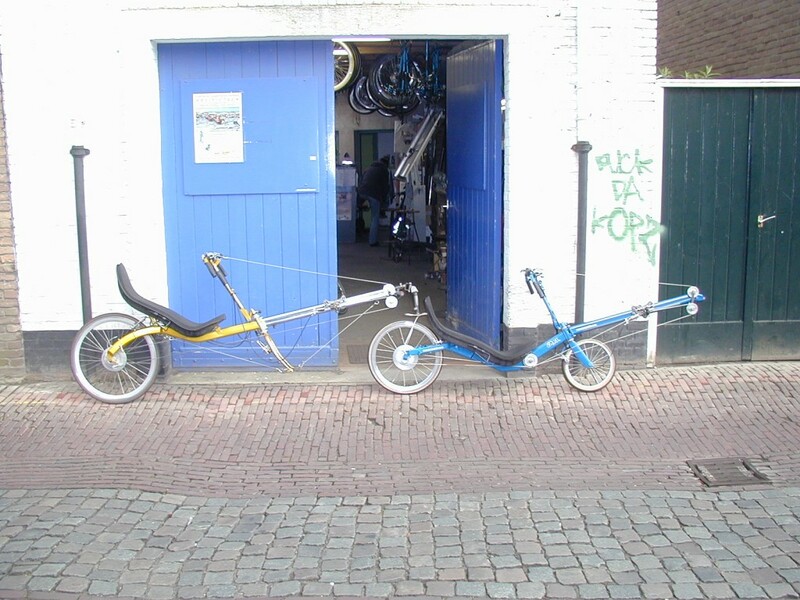 In April 2010 the first carbon rowingbike tandem was finished and it is a great ride!! 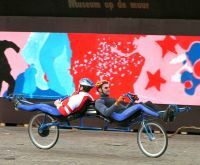 An experiment from a few years back repeated in 2017 for a race in the park, Meppen, Germany. A carbon 209 equipped with a carbon 24’’ front fork, 24 ‘’ front wheel with 24 aero-spokes, Ertro 571 rear wheel with 24 aero spokes and narrow fast high pressure tires. 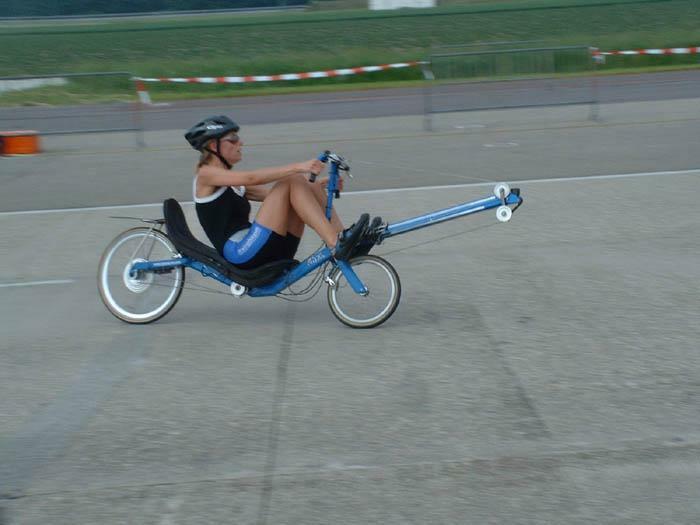 The result is a beautiful rowingbike, a tiny bit faster than the regular 209 but very much less comfortable. 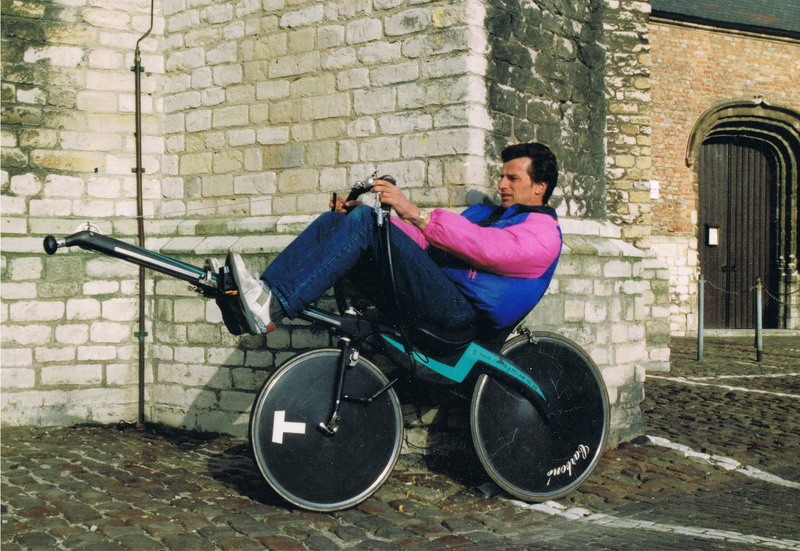 The more reclining position makes my back to hurt and the vibrations of the bike with the narrow tires are very uncomfortable. 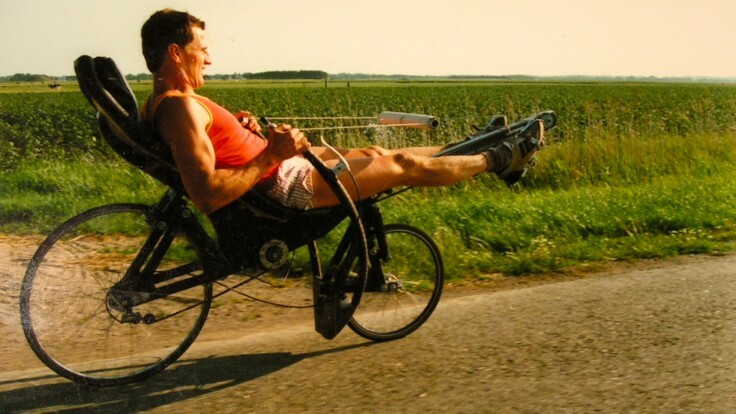 The gain of speed is not much perhaps 1 or 1,5 km/h on a one hour time trial.